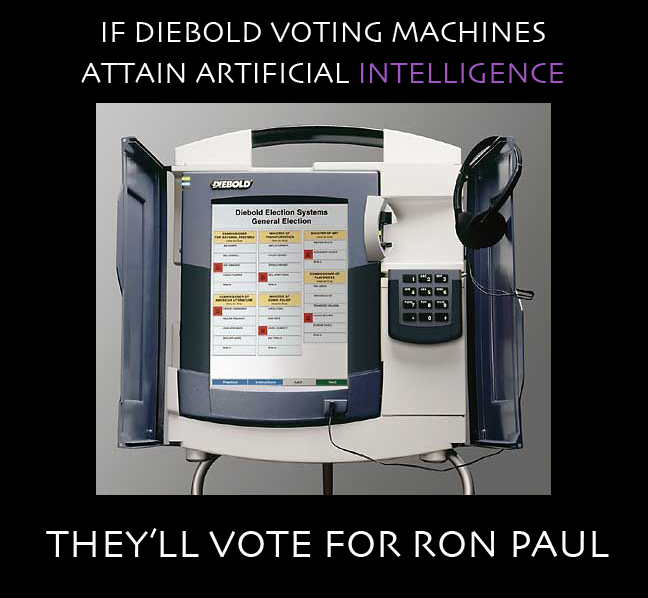 It's doubtful that Diebold voting machines will attain artificial intelligence soon . 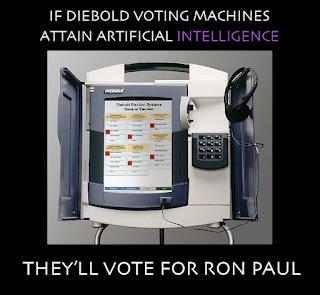 . .
Diebold voting machines are presently programmed to cast your votes correctly only in the case that 1) your vote is already for the Illuminati puppet du jour or 2) your vote for a non-Illuminati puppet du jour is irrelevant to the final outcome. 1. Malicious software running on a single voting machine can steal votes with little if any risk of detection. The malicious software can modify all of the records, audit logs, and counters kept by the voting machine, so that even careful forensic examination of these records will find nothing amiss. The software used in this video demonstration carries out this vote-stealing attack. 2. Anyone who has physical access to a voting machine, or to a memory card that will later be inserted into a machine, can install malicious software in as little as one minute. 3. AccuVote-TS machines are susceptible to computer viruses that can spread malicious software automatically and invisibly from machine to machine during normal pre- and post-election activity. 4. While some of these problems can be eliminated by improving Diebold's software, others cannot be remedied without replacing Diebold's hardware.